Last night (11.3.10) was the second in a two-part continuing medical education program, sponsored by Boston University Medical School, for family practice physicians in the virtual world. 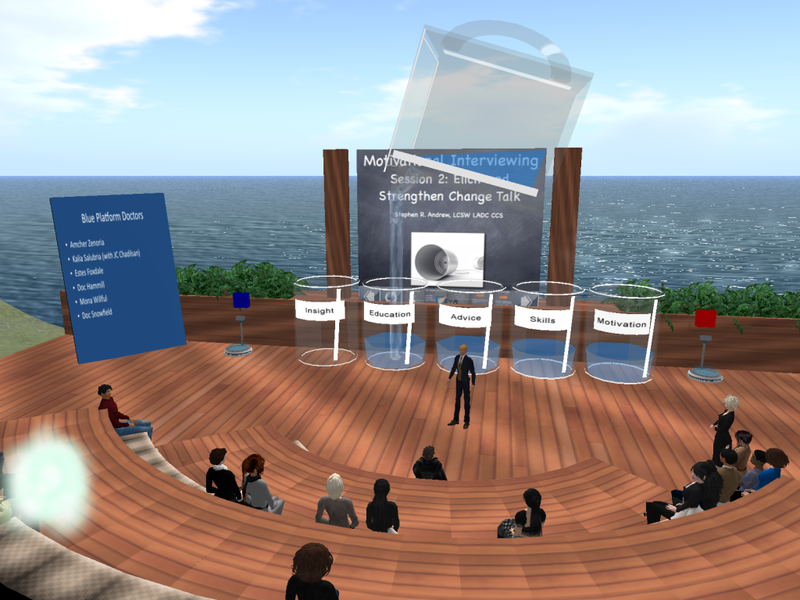 Thirteen doctor participants joined us in Second Life, from all over the United States, in order to learn about motivational interviewing. For background on motivational interviewing and our first event, hosted last week, you can read this earlier blog post. Though MI is the skill at hand, the content in this case was colorectal screening. Apparently, it is quite difficult to get patients to agree to this widely accepted and extremely effective method for rooting out a common cancer before it takes hold. And it’s that kind of behavioral change difficulty which MI is particularly effective combating. Helping patients to change their diet, quit smoking, or kick substance abuse habits – MI has an impressive track record. These two virtual world sessions were part of a larger, five-week instructional design that included online activities, video skills boosters, doctor-patient practice interviews conducted via Skype, and online pre and post questionnaires. 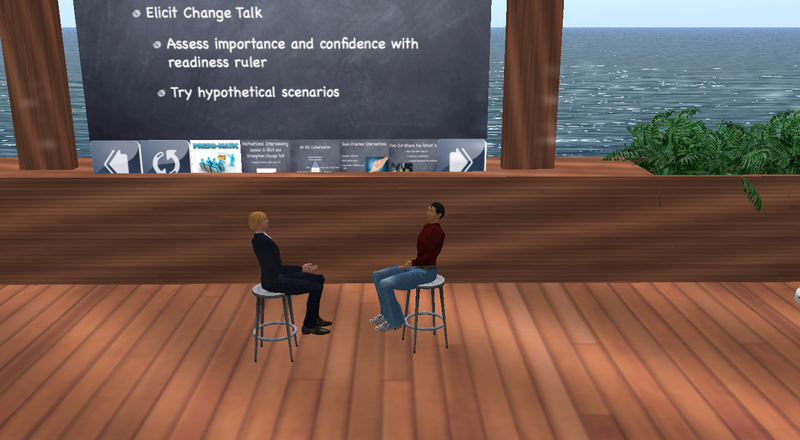 The virtual world portions were designed to deliver two things: rich lectures from a motivational interviewing expert and coached practice with mock patient avatars. The two SL events followed the same basic structure. The doctor participants gathered at the Boston University Second Life venue at 5:30 pm EST, the lecture began at 6:00 pm, and the small group practice started at 6:40. In the practice sessions, each physician tried their hand at a 10-minute session with a standardized patient. The patients were trained in advance, their health scenarios and resistance to the test scripted. As the practice interview proceeds, the MI coach gives helpful advice, stops them when necessary, and wraps up the interview with observations and suggestions for next time. Their fellow physicians observe, chime in with their own insights and appraisals, and learn from their brethren with each successive interview. In this videoclip from the lecture portion of the event, the MI expert, Stephen Andrew, makes a point about the medical profession’s traditional view of doctor/patient interaction….we fill our patients up with advice, medicine, and skills. His point is illustrated with a larger-then-life water pitcher, filling each “glass” (bearing the labels – skills, advice, education, insight, motivation) with water. After pouring all five, the audience can see that the pitcher is empty (the doctor is spent). At which point, Andrew asks, “But what if there were a sixth glass?” Cue: raise a sixth glass, brimful of water, from the stage. “Think of that glass as your patient – full of possibilities. Full of solutions.” Andrew explains his analogy, with his avatar perched on the rim of the sixth glass, looking out at the seated doctors. In the photo to the right, Andrew conducts a “model interview” with a standardized patient in order to give them a sample of how success would look and feel. The doctors are encouraged to ask questions and make comments in local chat, which Andrew enthusiastically answers. In these pictures, just below, you can see the small group arrangements, on sky platforms. The doctor and his/her standardized patient sit on the “hot seat” stools while the other doctors look on from the maroon-colored couches. The interviews are conducted using SL voice, the observing docs are encouraged to provide comments and questions in local chat. The data has yet to be compiled but, on the face of it, the event was a success. There was a marked improvement in the doctors’ technique from the first event to the second, with many of them able to effectively navigate the subtle waters of an MI conversation. It’s not at all difficult to visualize the process played out here into its by-product. As a result of this experience, the doctors will take a different, and more effective, approach to difficult conversations with their patients. And they’ll think about it. Geographical – it was relatively easy to get people in different locations and time zones together in a warm, congenial, attractive, and personal environment. Immersive – the doctors were fully engaged and present. They turned to face the MI coach, stepped forward to meet their patient, eagerly donned the stethoscope we gave them, and laughingly quaffed the virtual champagne we handed out at the end. They were all so clearly there. Anonymity – behind their avatars, the doctors felt able to take a risk – to try something new, to attempt something they might never try if they were known to the group, if their flaws were recorded. Of course, those advantages came with companion costs. The technical hurdles are steep. 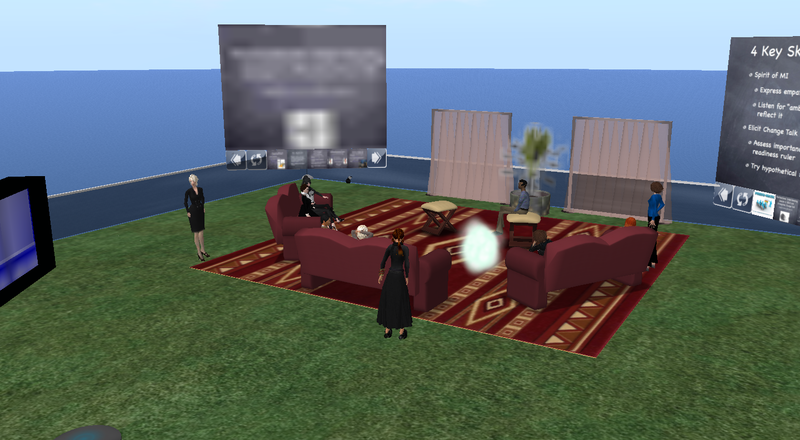 Participants were screened for sufficient computing power and bandwidth and had to get up to speed on a fairly robust platform (navigation and communication in Second Life requires concentrated effort). And even with our careful planning and preparations, we still encountered a raft of technical difficulties during the events. Unexpected firewalls, slow internet connections resulting in lag, sound problems (“I can’t hear”…”I forgot my headphones”… “No one can hear me when I speak”…). These technical issues are not for the faint of heart and I would never recommend conducting an event like this without solid technical support. For these events, we were fortunate enough to have the best of the best in that department. Janalee Redmond (SL = Jenn Forager) and Liz Dorland (SL = Chimera Cosmos) rescued us from countless Gordian tech-knots and did it all with calm, patience, authority, and humor. Quite honestly, we could not have done it without them. But in the end, it was all worth it. We saw the doctors grow and change from Event 1 to Event 2. We learned new insights into the patient perspective from our indefatigable standardized patients, Neil Heyden and Karen Gulliver. And we experimented with a new way of doing things – tested its metal, figured out a few flaws, and tapped its unique affordances. I’m pretty certain that our participant docs will carry around the image of that sixth glass for some time to come.